While I was in Berlin for a week, I ate both junk food and did some fine dining. There are great examples of both. The fine dining meals deserve posts of their own, I’ve already reviewed the Lucky Leek and there is another post coming up about dinner at Kopps. On the junk food front, one of the yummiest things I had was a double cheese meatball sandwich with a beer at an all vegan bar called Chaostheorie, a five minute walk from where I was staying in Prenzlauerberg. It was really tasty even though it was inexplicably served on dreadful square white sliced bread. Germany has such great bread, so it is really hard to know why. It would have been really spectacular on a crispy roll. The bar staff were friendly and there was a bonus of a dog sleeping next to my table, though she was more interested in tidbits than smooching. They have limited food and most of it isn’t going to win any awards but the sandwich I had was perfect with a beer. Now, speaking of junk food, we need to talk about currywurst. It is an obsession in Germany, Berlin in particular, and it is really hard to know why. There are stands and shops selling them everywhere. So against my better judgement I tried a vegan one. 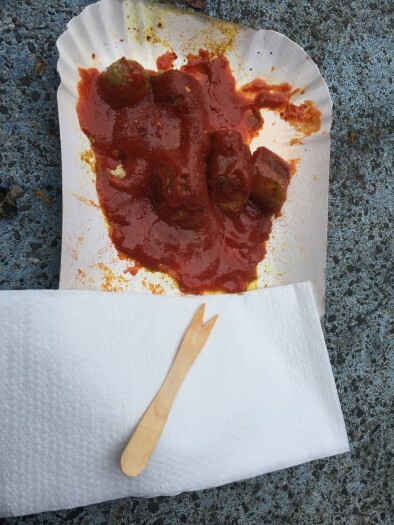 A currywurst, for the uninitiated, is a sausage cut into sections, sprinkled with curry powder and drowned in ketchup. If you say you like it spicy they’ll throw on some chilli flakes. It is hard to know what kind of mind dreamed it up. I can only assume it started life as a late night food for drunks. For the record it was bad. Worse than bad. Just inexplicable. Once I’d sampled a couple of bites, for science only, I threw the rest in the bin. I had booked in for a Turkish bath at a hammam for women that is situated in an old chocolate factory in Kreuzberg that is now a women’s centre. I’ve only had one other Turkish bath in my life and that was in Turkey. They are a wonderful experience and so I was delighted to find one in Berlin and booked immediately. I spent a few hours steaming and pouring warm and cold water, getting scrubbed and soaped and doused and emerged relaxed and sparking clean and soft. if you ever get the chance, I can highly recommend it. Later that night I grabbed a quick dinner at Momos (not junk food at all) where they make 6 kinds of vegetarian dumplings, 4 of which are vegan. I ate 3 kinds: pumpkin and chickpea, potato and mushroom, and tofu, broccoli and shiitake with a couple of dipping sauces. I demolished 18 of them (pictured above), half steamed and half fried at the tiny shop. Delicious. They were so good that I went back a second time later in the week.